Ever wondered how your faith can make a difference in the world. Join in a peaceful exploration of living out our identities as women of God in our busy active lives. Discover how your faith can be expressed each day, honouring your uniqueness, by God's power, impacting the world for good. This journey is ripe with possibility, driven by God's creative, redeeming and guiding love active in our lives so that others will be touched by that same love. Pastor Julianne was born and raised in London Ontario, the middlest girl of three daughters and a son. Raised in a Christian family, she was drawn to a teaching career and graduated from the College of Family and Consumer Studies at the University of Guelph with a major in Applied Human Nutrition. Her oldest son was born in Moncton and her youngest son in Ottawa. Pastor Julianne married Dave in Calgary August, 2004. Quilting, her grandmother's favorite past-time, has recently become a creative expression for Julianne. The first quilt she made went to her grandson Noah. 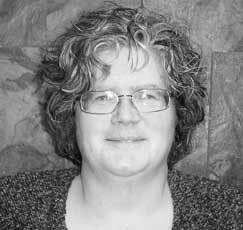 Pastor Julianne began her "official" theological training in 1996 as a distance learner, while serving as Minister of Faith in Life, Lutheran Church of Our Saviour, Calgary. After finally receiving her Master of Divinity from Luther Seminary, St. Paul, MN in 2004, she moved back to Calgary. Her studies concentrated on Youth and Family ministry since her passion in ministry is for healthy families, unity in the church and sharing God's love. As an international student, Pastor Julianne had the opportunity to hear incredible stories of God's work worldwide and meet many people form around the world. Palm Sunday, 2004, First Lutheran voted to call Julianne to serve in the congregation as their Lead Pastor. Pastor Julianne started her ministry at First Lutheran in June 2004 and is still after seven years excited about leading the congregation. First Lutheran's commitment to serving God through Christ centred living is lived out in community gatherings such worship, home groups, Bible studies and in caring ministries. Pastor Julianne continues learn as a student in Congregation Mission and Leadership, a Doctorate of Ministry program of Luther Seminary, St. Paul, MN. A group of lay women will plan and lead our worship sessions for the weekend. ENTHEOS is just west of Calgary, Alberta and is located in a lovely, natural setting. There are woods that border the Elbow River with walking paths, outdoor stations of the cross, a campfire pit, and frequent animal visitors - deer who come to graze on the lawn. The accommodations are shared rooms and baths (2 people per room) in two 3-story sleeping lodges. Bed linen is supplied and all the meals are prepared by the staff. The main lodge has a large meeting room, a cozy fireside room, and a chapel, with the dining room and kitchen downstairs. There are stairs in all buildings and an elevator in the main lodge only. If you have difficulty with stairs, there are rooms on the ground floor in one of the sleeping lodges.